Store Fixtures in Fort Myers! Metal Gondola Shelving is another popular and multi-functional merchandising solution for any space. Island gondolas can be used as free standing units or to create a run with starters and add-ons. Our Gondola shelving is heavy-duty with tan or black powder-coated finish. Metal Shelves & either a peg board or solid back offer flexible merchandising options. A Starter Unit is complete with 2 uprights, base shoe covers & end trim pieces. This unit can work as a free standing display or as the beginning section to a run. An Add-On unit comes with a single upright and is used to connect sections to create a run. Gondolas are made with heavy duty steel to accommodate heavy loads. The built in levelers and snap together parts make assembly quick and easy. Grid Panels offer the most flexibility of anything that we carry. Grid and Slatgrid panels can be mounted on the wall or used with one of our grid bases to create a grid floor display. We offer hundreds of options for grid hardware and accessories, including grid hooks, grid shelf brackets, grid faceouts and waterfalls, hat displays for grid and many more! For the retailer on the go, wire grid panels offer a convenient solution to handle tradeshow set up and tear down. 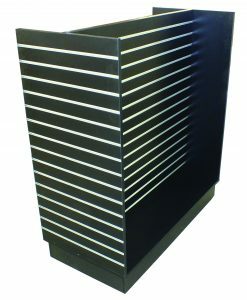 Our best seller is our collection of slat wall displays, slat wall fixtures and slat wall accessories. Slatwall is one of the most popular choices for retailers of all kinds. Slatwall panels allow flexibility to remerchandise with the change of a few slatwall accessories. The same flexibility is found with our slatwall display fixtures. Now offering select slatwall fixtures with metal extrusions for added strength and durability! Slatwall fixtures are freestanding floor displays that will give your store a sophisticated and elegant look. They provide multi sided displays to maximize your display area in a compact space. They are the most popular and economical floor displays. Our superior selection ranges from Slatwall panels down to slatwall hooks. We have everything you need to create the slatwall display for your space. Explore our superior selection of retail clothing racks! Clothing stores of all kinds depend on our retail supplies and store fixtures to showcase their clothes and apparel in the best way possible. Maximize your floor space with our round racks, tandem racks, 2 way racks or 4 way racks. Transport your merchandise with any of our rolling racks, or add casters to one of our other clothing racks! We also carry a variety of styles of specialty racks and garment rack accessories! Barr Display carries a wide variety of realistic mannequins and forms. Browse our adult mannequins, which include plastic headless mannequins, plastic mannequins, plastic retro high gloss mannequins, premium fiberglass headless mannequins, premium fiberglass adult mannequins, and retro high gloss fiberglass mannequins. Barr Display offers wigs for both adults and children as well. Our forms also come in many different sizes, styles, and materials. We have realistic forms, jersey form sets, body mold plastic forms, and mannequin head and hat display forms. Barr Display’s mannequins are perfect for any setting—clothing stores, sporting goods stores, boutiques and more. We are sure to have the mannequin you have been looking for. Barr Display offers a variety of showcases that are available fully assembled or ready to assemble. We carry a superior selection of Display Cases, Glass Tower Cases and Counters at everyday low prices! We can help you maximize your space with our retail display showcases! Looking for a different store fixture or glass display case? Give us a call and we can help!